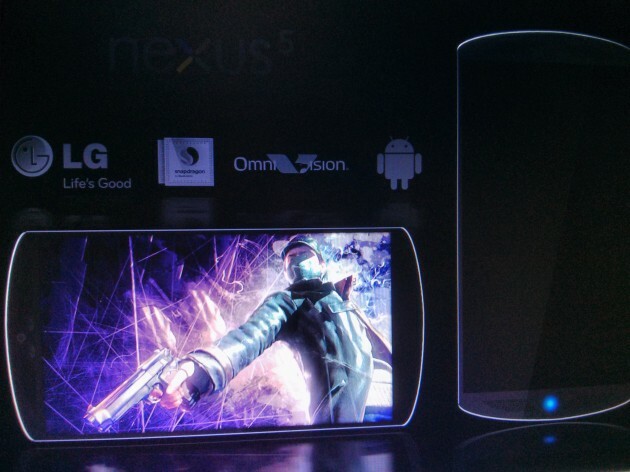 Now that the Samsung Galaxy S IV is official, make way for a new device in the rumor mill – the Google Nexus 5. It has been reported that Google is currently testing out Nexus 5 prototypes from various manufacturers and the first to get leaked out is one from LG that packs some pretty impressive specs under its hood. Codenamed Megalodon, the device is reported to feature a 5.2” FHD OLED display with a quad-core 2.3GHz Qualcomm Snapdragon 800 processor and 3GB of RAM. At the back, it will pack a 16MP camera made by OmniVision that is capable of capturing 4k videos at 30fps or 1080p videos at 60fps. With a camera capable of producing such huge files, it only makes sense for LG to go beyond the Google-imposed storage cap of 16GB, and offer options of up to 64GB. The front camera will be a 2.1MP one that can shoot 1080p videos at 30fps. Other specs include a 3,300mAh battery and front-facing stereo speakers. Software wise, the super phone will allow users to use gesture controls to perform tasks like navigation and zooming. No further information are available for now, the next Google phone, regardless of which manufacturer it will be from, is set to be announced in October, which coincide with the announced of the next big Android update – Key Lime Pie. Do you think that LG is indeed making such a device, or is it just a wish list from a very hopeful geek?